The Chandler & Price Treadle Kit for 10 x 15 Old & New-Style is generally kept in stock and will be shipped within a few days. FREE SHIPPING Included on ALL Chandler & Price Treadle Kits & Treadle Hook orders!! The Hern Treadle kits were reproduced from original pieces. 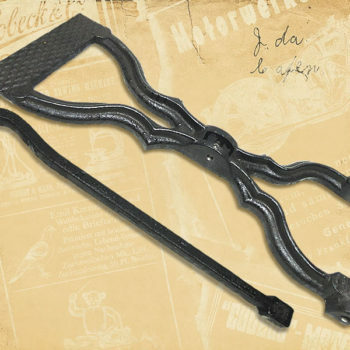 Patterns have been tested for the Chandler & Price presses and will generally drop in with only small cleaning and refinements of press and castings. Recognize that your press is unique – after near 75 years of production, and 50 plus years out of production – your press has been rebuilt and repaired a few times. There will be some minor differences press to press. 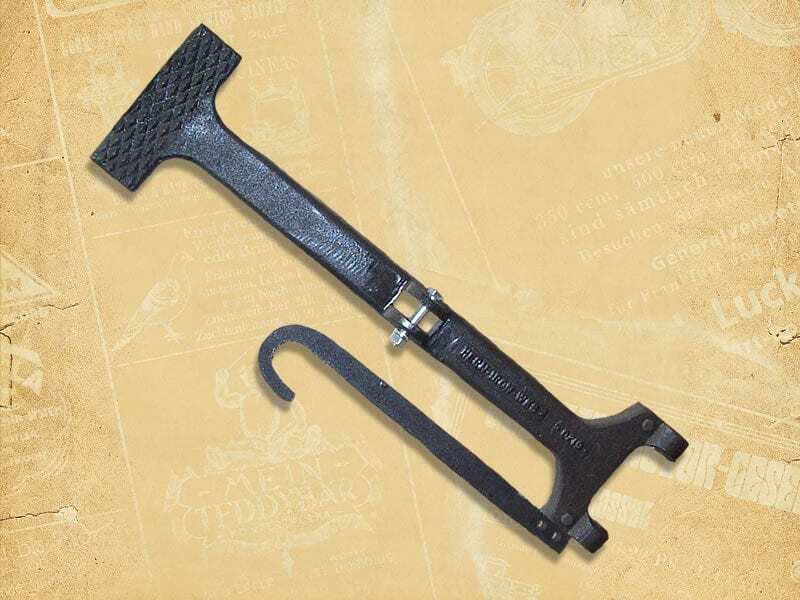 This kit includes: Treadle, Hook, and all Hardware to attach and use with your press. Pricing also includes reinforced packaging and shipping to your door! 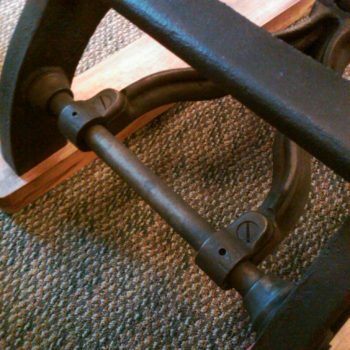 The 10 x 15 press utilizes the same treadle for both the old and new style press designs. The Chandler & Price Treadle Kit for 10 x 15 – #0219 — is generally kept in stock and will be shipped within a few days. The Chandler & Price Treadle Kit for 8 x 12 Old Style with hinge pin is generally kept in stock and will be shipped within a few days. FREE SHIPPING Included on ALL C&P Treadle Kits & Treadle Hook orders!! The Chandler & Price Treadle Kit for 8 x 12 New Style is generally kept in stock and will be shipped within a few days. 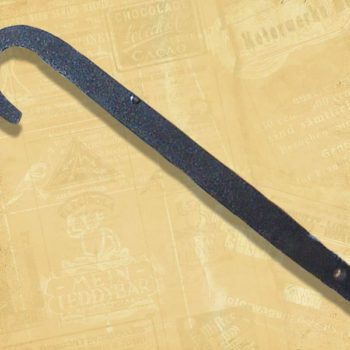 Replacement Hook ONLY – forC & P Treadle -10 x 15 Old & New-Style. Part #0219-A. Pricing includes shipping and handling, to your door. 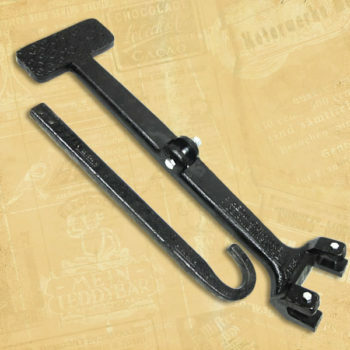 Hooks are always kept in stock – ships within one business day of payment! 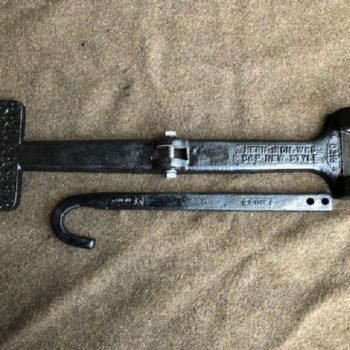 Remember to carefully fit and test rotation with hook in place before applying full power. You may have to do some touch up grinding or filing to custom fit the hook to your press, never force the fit – cast iron will not bend.